Never fly a fringed flag on a stationary or mounted (on a wall or post) flagstaff. See this article for information. From the day of death until interment of an Associate Justice of the Supreme Court, a secretary of an executive or military department, a former vice president, or the governor of a state, territory, or possession. Peace Officers Memorial Day (May 15), unless that day is also Armed Forces Day. Pearl Harbor Remembrance Day (December 7). 4 U.S.C. § 7(m) was modified by President Bush in 2007 requiring any federal facility within a region to honor a member of the U.S. Armed Forces who died on active duty. The when is taken care of, but how is flying the flag at half-staff accomplished? 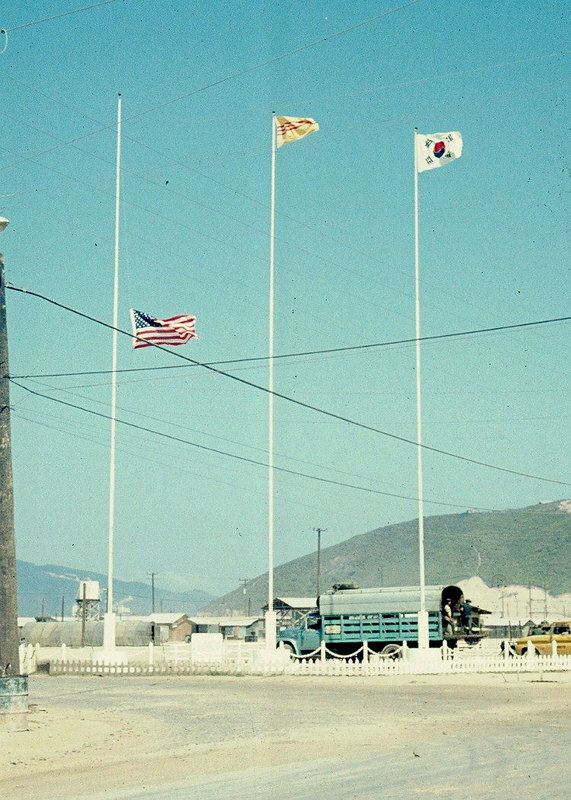 Raise the flag as normal, quickly to the top and then slowly to half-staff. When the flag is ready to come down, raise it quickly to the top and then lower it slowly all the way down. A black ribbon that is attached to the top of the flagstaff- yes, above the American flag- for occasions of mourning. See the picture at left and right. These two flags pictured cannot be brought to half-staff (no halyard on the staff), so the mourning ribbon signifies the occasion. What about when other flags fly with it? Don’t all of the flags need to be flown at half-staff? Yes, and no. American state flags are given the same consideration in each state as the American flag. Our Founding Fathers gave the term “United ‘States'” to all of the territories which was shocking back then since “state” means a nation. Each American state has its own laws concerning their flag. Here is information concerning Maryland’s flag laws as an example. 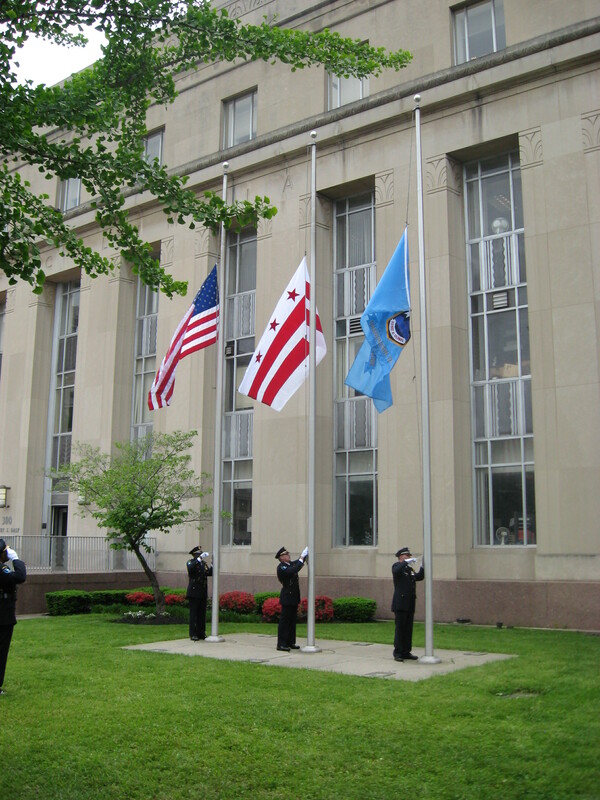 The picture here of the DC police (from washingtonpost.com) with all three flags lowered is fine for the United States. However, lowering anything other than an American, state and territory flags is in keeping with the reason behind the flag being at half-staff: organizational flags, really any other flag (in America, that is) should be lowered to half-staff since they would be higher than the American flag even though they have no part in rendering the honor or signaling mourning. It is a similar situation like we see next. But the American flag is lower than the other flags in this picture! Take some deep breaths, you’re missing the point here. Not all countries have to lower their flags and not all flags must be at the same height all of the time. This 1968 photo, by John Wright on Smugmug, is from the Viet Nam war. The picture is from when Dr. Martin Luther King, Jr. was assassinated. It was not necessary for another country to lower their flag. This situation is proper. A similar situation is when an overseas military installation loses one of its active duty members. It is a sad, solemn occasion and the installations American flag is flown at half-staff for a short period as a signal to all that the base lost one of its own. 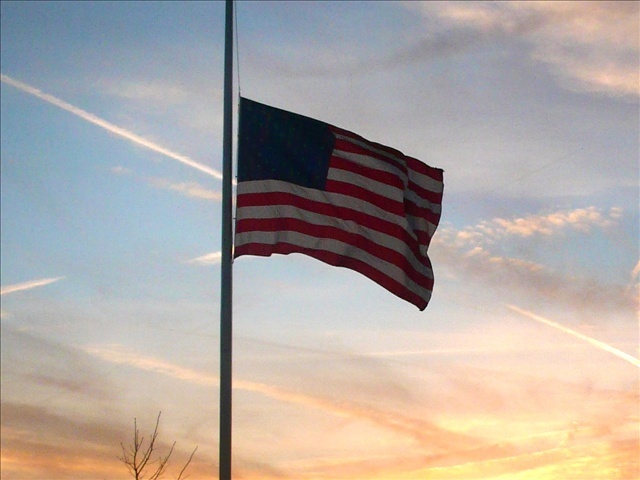 The host nation’s flag do not need to be brought to half-staff; it is not necessary. The liaison to the base can say otherwise. The point here is not stop getting worked up over something that is relatively trivial. Don’t just think you know the rules, read them and have them ready as a reference. What about other flags at half-staff and the American flag at full staff? 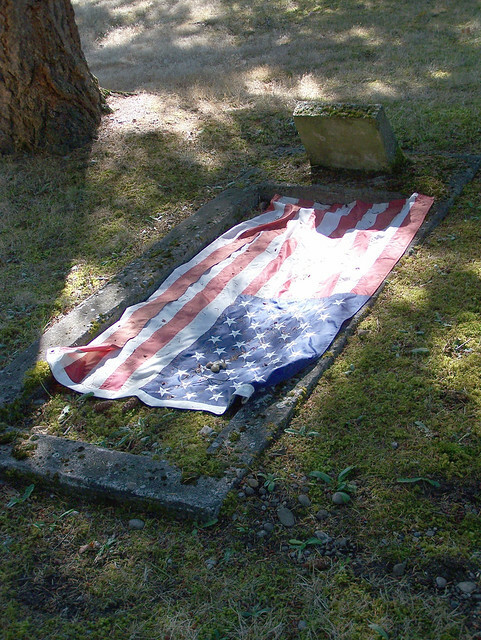 What about a flag draped on a casket? What if I want my dog to crawl from under the flag while it is on the floor? The dog means no disrespect. I’m sure it doesn’t! However, I’d like to draw your attention to some key words here, the flag is on the floor. It is also draped over an animal, not a casket and not flying free. Does that give you any clue as to how disrespectful it is? Folks, this is not my photo, I’m just using it to illustrate a point. And yes, I was told that the dog does not mean any disrespect when I told the owner of the photo that the dog is cute but the flag on the floor isn’t cute. Many people have the wrong thing and keep doing it because they don’t know what is proper or don’t care what is proper. Flag Etiquette from USHistory.org. I guess that’s enough for this article. Questions or comments? Please let me know! Hi! Thank you for providing information on the proper way to handle the American Flag. I do have a question…. The Fresian horse in the picture doesn’t actually have a flash draped on him; it’s a decorative banner that you would put on your porch. 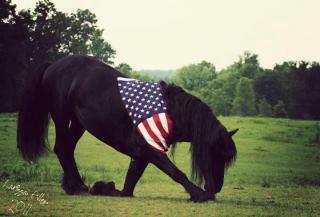 The photographer knew not to put an actual flag on the horse (I follow get Facebook page). My question is: Are there different rules that would apply to a banner or anything that has stars & stripes but is not actually the flag? Thank you for any clarification you can give. Thank you for letting me know about the picture of the horse. However, to answer your questions, the Flag Code states that something that resembles the American flag is to be treated as the flag, even bunting or a drape. Section 176, below, states what bunting is and how it is displayed- flowing freely. Section 3, at the bottom, describes a thing that reasonably resembles the flag. 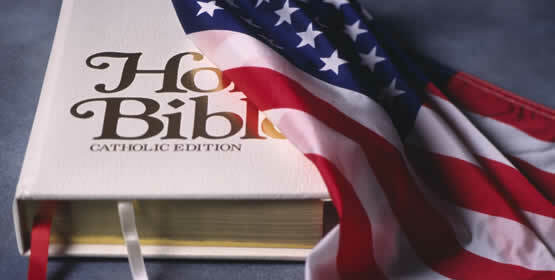 The words ‘flag, standard, colors, or ensign’, as used herein, shall include any flag, standard, colors, ensign, or any picture or representation of either, or of any part or parts of either, made of any substance or represented on any substance, of any size evidently purporting to be either of said flag, standard, colors, or ensign of the United States of America or a picture or a representation of either, upon which shall be shown the colors, the stars and the stripes, in any number of either thereof, or of any part or parts of either, by which the average person seeing the same without deliberation may believe the same to represent the flag, colors, standard, or ensign of the United States of America.